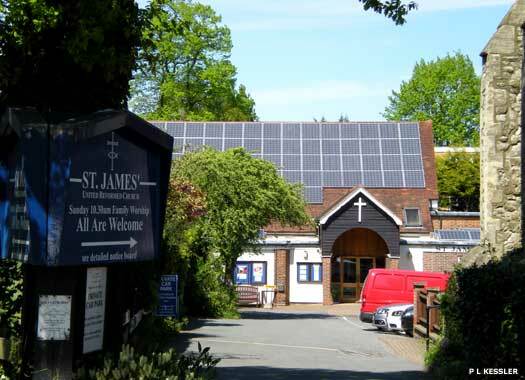 St James United Reformed Church is on the north side of Palmerston Road. The first nonconformist meetings in Buckhurst Hill took place soon after the arrival of the railway. In 1863, Baptist Mr Gingell, of Hill Farm, built a mission room in Alfred Road. In 1864, Woodford Congregational Church started services in a room next door to the 'Bald Faced Stag' and at the house of a Mr Straker, 'Fairlands'. 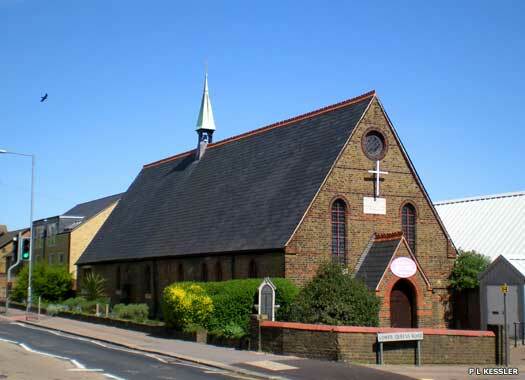 In 1866, the missions united to form Buckhurst Hill Congregational Church. In 1871, secessionists formed King's Place Independent Church a little to the east (see below). In 1874, Palmerston Road gained a new church, an imposing stone building consisting of nave, chancel (facing north), transepts, and south tower with pinnacles. A mission station was opened at Roding Valley in 1948 (long since gone). 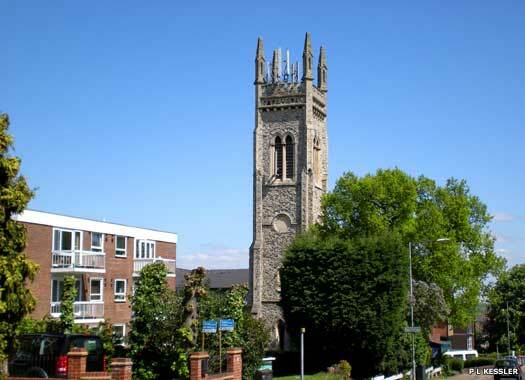 On Palmerston Road, the 1874 church was replaced by a new building set well back from the tower. The tower survived, attached to a block of flats. Queen's Road Baptist Church stood on the northern side of the street. Baptists were established here about 1861, and the church was built in 1866, with space for 250. Membership was low, and soon after 1890 the church was closed. 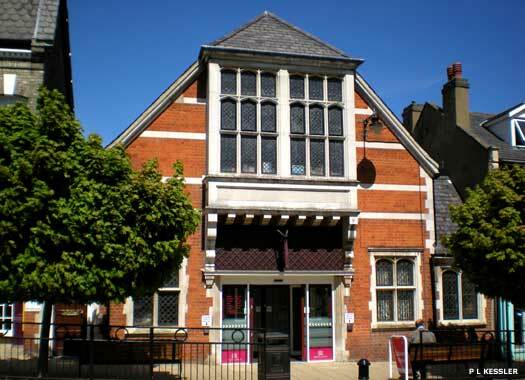 It later became Buckhurst Hill Hall, used for public meetings and entertainment, and is now a public library. An offshoot was Princes Road Baptist Church, in a 1902 iron building near the north-west end of the street, but this closed about 1934. 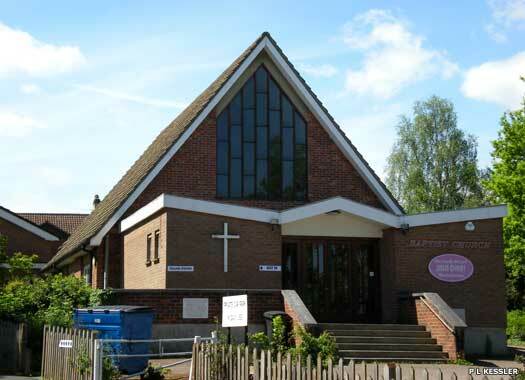 Buckhurst Hill Baptist Church sits inside the junction between Palmerston Road and Westbury Lane. 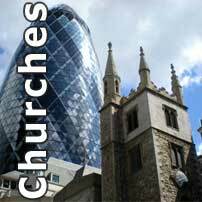 Worship began on the site in 1871 when members from Buckhurst Hill Congregational formed King's Place Independent Church. In 1900, they sold their old iron church to Baptists, and when they closed in 1906, the Baptists acquired their 1887 brick church which was on the same site. This was demolished in the 1960s and replaced with the modern church building. St Stephen's Chapel is on the north-eastern corner of Albert Road and Lower Queen's Road. An iron mission church was opened here in 1873, one of a huge number of 'tin churches' which were quick to erect in the Victorian era. This was replaced in 1876 by the present permanent brown brick church to serve as a chapel of ease to St John the Baptist, Buckhurst Hill. Neither St Stephen's nor its sister mission, St Elisabeth's (below), have a burial ground. 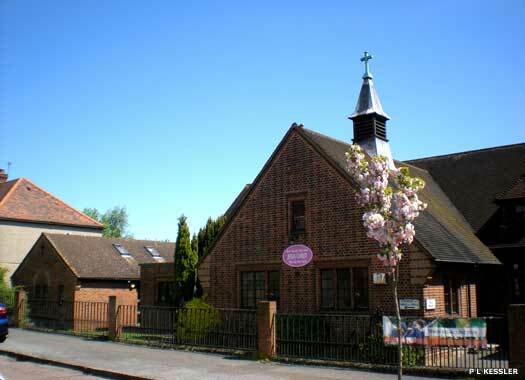 The Church of St Elisabeth is on the eastern side of Chestnut Avenue, on the southern edge of Buckhurst Hill where it meets Roding Valley. It was opened as a mission church for St John the Baptist in 1936, using the former iron church of St Stephen and dedicated to the Holy Child. This was replaced in 1938 by the present permanent brick-built church dedicated to St Elisabeth in honour of Mrs Elizabeth French, founder of a local building firm which paid for the church.